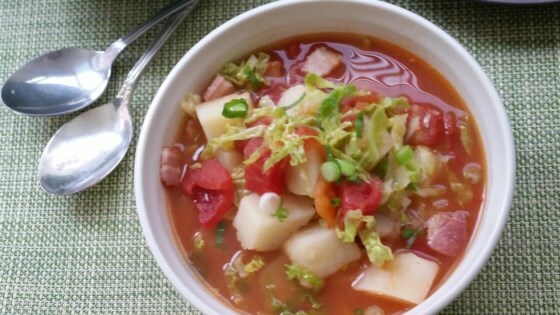 "This is a wonderfully simple chunky soup. I use good quality Irish back bacon but if you can't get this, it tastes equally good made with pancetta. The dark green colour of the cabbage alongside the tomatoes gives the soup a beautiful colour." Vegetable soup made decadent with bacon. We loved this soup. Used regular bacon and cabbage since that's what I had leftover. One change is that it takes a bit more chicken broth and/or water. Fanastic, made me think of home! I tried this recipe over the weekend and it was amazing, even my picky 2 yr. old ate it, and went back for more. this is by far the greatest soup i have ever had.